This course is intended for people who are comfortable with Jazzit basics and are interested in the more advanced options and recent updates to the package. We look at the 9 column financial statements, Not-for-Profit statements, interim statements, copying a note from a different client financial statement, specified foreign property, loan/lease calculator, and much more. 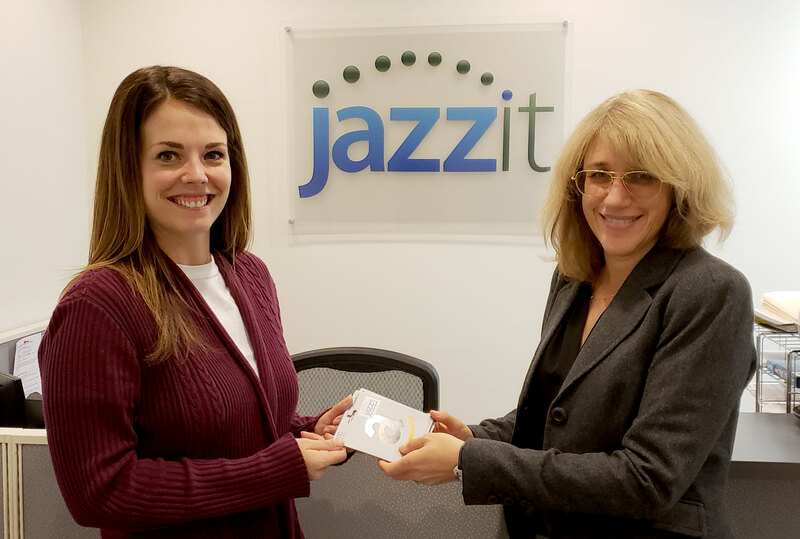 If you have any questions regarding Jazzit Training you can email them to training@jazzit.com. Plus some handy tips and tricks. We will also discuss why “unaudited” is no longer in the review engagement (CSRE 2400) financial statement headings by default. Click the image below to view the webinar video. The February 22, 2019, Jazzit Fundamentals update has been released and is available for download. Jazzit Administrators can find the latest release notes and downloads on our support site at: http://www.jazzitsupport.com/. Remember that Jazzit Fundamental updates are cumulative. Updating to this release will include all features and functionality from prior releases, together with any corrections made to the templates. 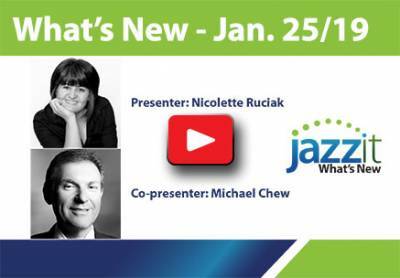 The January 25, 2019, Jazzit Fundamentals update has been released and is available for download. 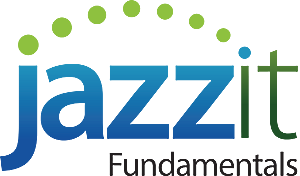 Welcome to the January 25, 2019, Jazzit Fundamentals update release notes. Signature line options have been moved from the bottom of the Balance Sheet to within the statement settings folder at the top of this statement for the 2 column Balance Sheet (BS) and the Balance Sheet with Opening Balances (BS3). Added the option to round amortization expense to the nearest dollar in the Property, plant and equipment (CA/CB) Working Papers. Added the option to sort groups alphabetically by group title in the Property, plant and Equipment (CA/CB), Continuity of Disposals (CE) and Intangible Assets (IA) Working Papers. Added the option to skip risk headings in the Financial instruments – option 1 (K8) note. Click on the link below for more details on what’s new in the January 25, 2019 update. Remember that Jazzit Fundamental updates are cumulative. Updating to this release will include all features and functionality from prior releases, together with any corrections made to the templates. Effective December 1, 2018, all updates and any new templates will be available in CaseWare 2018 format only. We will continue to provide support for CaseWare 2017 however if the resolution requires a template update it will only be available in CaseWare 2018. Please be aware that CaseWare 2018 is only available as a 64-bit version. For more information on hardware/software requirements please refer to CaseWare's website at caseware.com. The November 30, 2018, Jazzit Fundamentals update has been released and is available for download. Welcome to the November 30, 2018, Jazzit Fundamentals update release notes. Please check our November 30 "What's New" document found in the link provided below for a complete list of updates. 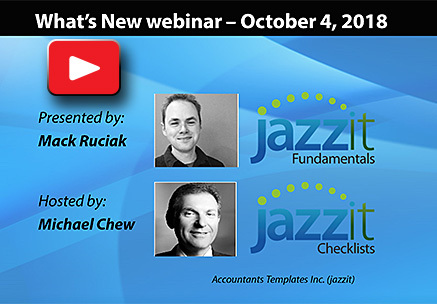 This video presents the major updates to Jazzit Fundamentals and the Jazzit Checklists as of October 2018. The September 28, 2018, Jazzit Fundamentals update has been released and is available for download. Jazzit print package (JZPACK) is a new template allowing you to print your client financial statements with letters to a single file. Documents can also be sorted in any order. Both the 2 column and 9 column Income Statements now support the ability to insert subtotals which add amounts below the last subheading. Please check our September 28th "What's New" document found in the link provided below for a complete list of updates. Our review and audit checklists have been updated for the 2018 PEG update from CPA Canada. Navigate to the Downloads page at jazzitsupport.com to update your package today! The August 10, 2018, Jazzit Fundamentals update has been released and is available for download. The Audit Engagement Report has been updated to include the post-auditor reporting (mandatory for year-ends on or after December 15, 2018). The Engagement Letter (JZEL) and Management Representation Letter (JZRL) for changes included in the latest PEG release including post-auditor reporting in the engagement letter. With the exception of pre CSRE 2400 review engagements, all engagements should now be using the new engagement letter (JZEL) and new management representation letter (JZRL). The old letters (EL/RL) are being phased out. The Audit Engagement Report now support the option to select between pre and post auditor reporting. The Financial Statements Checklist extensive revisions including: expanded number of columns, individual document sign-off, new comment and detail lines. Please check our August 10th "What's New" document found in the link provided below for a complete list of updates. This video presents the significant updates to Jazzit Fundamentals for the first half of 2018. We think you will want to start using these updates to the statements, working papers, letters, and generic checklists in your engagements right away. The May 31, 2018, Jazzit Fundamentals update has been released and is available for download. Welcome to the May 31, 2018 Jazzit Fundamentals update release notes. The modules listed in the link below are dated May 31, 2018 in your Resource Centre JZUPDATE RC update control document. electronic signatures (sign off engagement completion electronically). The April 27, 2018, Jazzit Fundamentals update has been released and is available for download. Welcome to the April 27, 2018 Jazzit Fundamentals update release notes. The modules listed in the link below are dated April 27, 2018 in your Resource Centre JZUPDATE RC update control document. The March 29, 2018, Jazzit Fundamentals update has been released and is available for download. Welcome to the March 29, 2018 Jazzit Fundamentals update release notes. The modules listed in the link below are dated March 29, 2018 in your Resource Centre JZUPDATE RC update control document. The March 2, 2018, Jazzit Fundamentals update has been released and is available for download. Welcome to the March 2, 2018 Jazzit Fundamentals update release notes. The modules listed in the link below are dated March 2, 2018 in your Resource Centre JZUPDATE RC update control document. The February 2, 2018, Jazzit Fundamentals update has been released and is available for download. Welcome to the February 2, 2018 Jazzit Fundamentals update release notes. The modules listed in the link below are dated February 2, 2018 in your Resource Centre JZUPDATE RC update control document. The January 10, 2018, Jazzit Fundamentals update has been released and is available for download. Welcome to the January 10, 2018 Jazzit Fundamentals update release notes. PE/DI/JZAL – PREPAID EXPENSES, DEFERRED INCOME, ACCRUED LIABILITIES WORKING PAPERS: The amount of decimal points can now be set in the working papers. The modules listed in the link below are dated January 10, 2018 in your Resource Centre JZUPDATE RC update document. 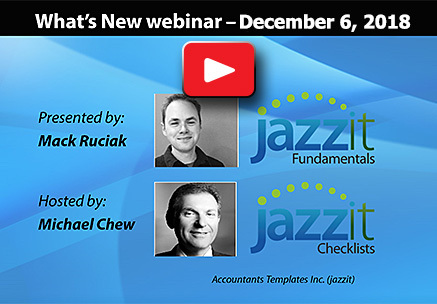 This free webinar will help you migrate from our Jazzit CPEM/PPM checklists to the new Jazzit PEG checklists. We will also discuss the Jazzit PEG review checklists with regards to CSRE 2400.